I am presiding at the Community Eucharist in the Chapel of the Church of Ireland Theological Institute this evening [11 March 2015]. We are using the Collect, Readings and Post-Communion Prayer for the Third Sunday in Lent, and the Visiting Preacher is the Right Revd Kenneth H Clarke, Mission Director of SAMS UK and Ireland. The readings are: Exodus 20: 1-17; Psalm 19; I Corinthians 1: 18-25; and John 2: 13-22. 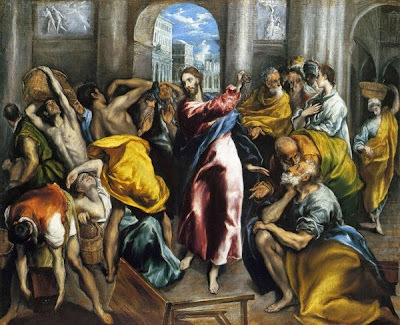 Our cover illustrations on the brochure for this evening’s Eucharist are from El Greco’s painting, ‘Christ driving the Traders from the Temple,’ which is inspired by the Gospel reading. El Greco painted this subject several times in Italy and in Spain. This version, with its strong colours and elongated forms, was probably painted in Toledo ca 1600, and is now in the National Gallery, London (Room 30). This painting is dominated by the figure of Christ, with the traders on the left and the Apostles on the right. In the 16th century, the subject of the Purification of the Temple was seen as a symbol of the Church’s need to cleanse itself through condemning heresy and through reform. The reliefs in the background allude to the themes of punishment and deliverance. On the left, Adam and Eve are being expelled from Paradise, which prefigures the Purification of the Temple, and on the right the Sacrifice of Isaac prefigures Christ’s death. Doménikos Theotokópoulos (Δομήνικος Θεοτοκόπουλος, 1541-1614), or El Greco, was born in Crete and trained there in a Byzantine school of art in Iraklion. He later worked in Venice under Titian and in Rome, where he studied the work of Michelangelo and Raphael. In 1577, he moved to Toledo, where he lived the rest of his life. The 400th anniversary of his death was marked with special events and commemorations last year. It is an Anglican tradition not to sing the canticle Gloria throughout Lent and Advent, nor do we pray the doxology at the end of Psalms and canticles, reserving our joy in Lent until the joy of the Resurrection on Easter Day (and similarly in Advent in the expectation of the joy of the Incarnation). This evening’s hymns reflect the theme of Lent and the themes of our readings. During Lent this year, I have been meditating and reflecting each morning on a hymn or on a piece of music associated with the great English composer, Ralph Vaughan Williams. The tune for each of the hymns I have chosen this evening has been written or harmonised by Vaughan Williams. The Processional Hymn, ‘Come down, O love divine,’ (Hymn 294, Irish Church Hymnal) was originally written in Italian in the 14th century by Bianco da Siena. It was first translated into English in 1867 by the Revd Dr Richard Frederick Littledale, a Dublin-born Anglican priest. The tune Down Ampney by Vaughan Williams is named after the Cotswold village in Gloucestershire where he was born and where his father, the Revd Arthur Vaughan Williams, was the vicar. Our response to the Lenten Penitential Kyries is adapted from the Lent Prose, Attende, Domine (Hymn 208). Its origins are in the early Mozarabic liturgy of the Iberian Peninsula, the Paris Processional (1824), and the work of the Benedictine Abbey in Solesmes. The refrain we sing was arranged by Martin White, Organist of Saint Patrick’s Cathedral, Armagh. The Gradual, ‘Rise and hear! The Lord is speaking’ (385) was written in 1980 by Canon Howard Grant (1902-1983), a prolific hymn-writer. The tune Sussex was collected by Vaughan Williams, who first set it to ‘Father, hear the prayer we offer’ (see Hymn 645). The Post-Communion Hymn, ‘Go forth for God; go forth to the world in peace’ (455), a parting hymn of encouragement, is by Canon John Peacey (1896-1971), who was Dean of Selwyn College, Cambridge, Principal of Bishop’s College, Calcutta, and Canon Residentiary of Bristol Cathedral. The tune Magda was written by Vaughan Williams for his niece, Magdalene Fisher, for her marriage to Sir Antony Macnaghten in 1926. The couple later lived near Bushmills, Co Antrim.